I have a weakness for sinful appetizers. When I saw uber-blogger Michael Ruhlman’s post on homemade kreplach, I had to make them. Kreplach is a crispy dough pocket stuffed with soft fillings like potato or meat. Think of kreplach as a Jewish wonton, dumpling, or samosa. Many cultures have their own version. I have fond memories of eating kreplach as a child. My mother’s best friend Lila served them at all her parties. Too bad nobody wrote down the recipe. I don’t think I’ve had kreplach since. Subsequent generations don’t seem to make kreplach, but I decided to change that. I quickly formulated a game plan. I decided to make two kinds: some with mashed potatoes and some with leftover brisket, which I happened to have. 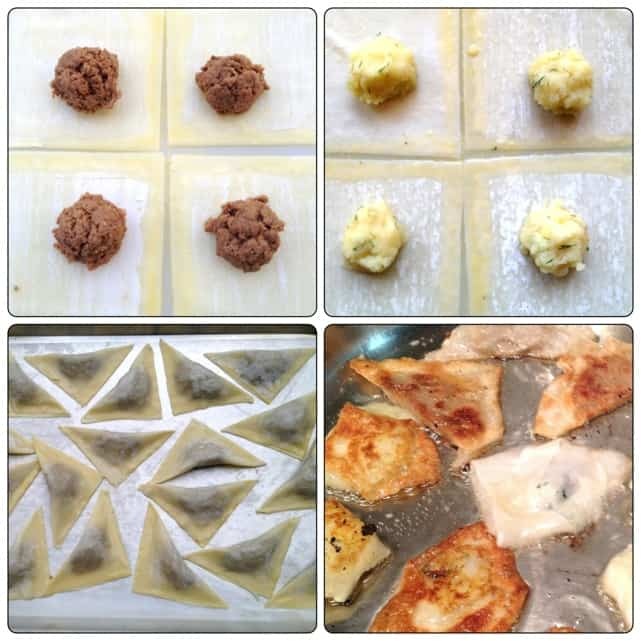 For the dough, I thought using store-bought wonton wrappers would be a helpful shortcut. My friend Carrie recently used wonton wrappers to make homemade ravioli with success, so I figured the wrappers would work with kreplach too. How hard could it be to wrap some leftovers in premade dough squares? Before I knew it, my kitchen was a whirlwind of kreplach making. Sometimes I go a little crazy in the kitchen. I get obsessed and take on too much for my day. What was I thinking? Making kreplach isn’t difficult, but it turns out to be a labor of love. I folded, boiled, and fried well into the night. Oh, but those crispy pockets of dough with soft, yummy fillings are so worth it. Think of making kreplach as a rainy day project. The kreplach can be frozen after the boiling step. 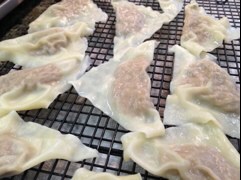 It works out well to make the kreplach when you have some time, then freeze them until ready to fry and serve. 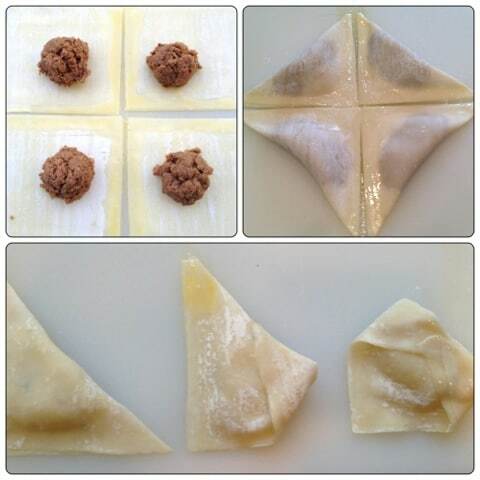 I tried two different brands of premade wonton square wrappers, and both came out well. The first is called House Foods All Natural Square Wraps. I purchased it at a specialty Japanese market called Nijiya Market on Sawtelle Boulevard in West Los Angeles. I like this wrapper best because it is a little thicker and easier to handle. It is also kosher. The other wrapper I tried is Dynasty Won Ton Wrappers, which I purchased at Ralph’s Market, a large chain. I found it in the refrigerated section near the tofu. The Dynasty dough is thin and needs to be handled carefully. I only ripped a few and managed to patch them up or boiled them anyway when the holes were tiny. Furthermore, the thicker dough retained its triangular shape well. 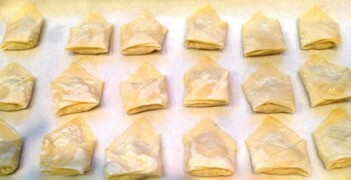 With the thin dough, the triangular corners were too fragile so I folded them in like an envelope, a great solution. Folding Kreplach: Row 1 shows meat kreplach being folding into triangles. Note the egg wash at the seams. Row 2 shows how to fold a floppy triangle into an envelope shape. I like to serve the potato kreplach with dipping sauces. I made one with creme fraiche and the other with apricot jam. My choices were influenced by the sauces that Susan Feniger puts on her potato dumplings at her restaurant Street in Los Angeles. 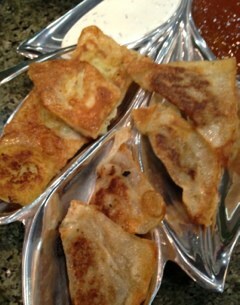 I like the brisket kreplach without sauce, but some of my guests enjoyed sauce on the brisket as well. These kreplach did not disappoint. What could be better than crispy dough filled with soft, moist, tasty fillings? I’m excited that I still have a few left tucked away in the freezer for a treat on another day. More folded kreplach waiting to be boiled. What the kreplach looks like after it has been boiled. 1. Sauté onions in olive oil over medium heat stirring occasionally until carmelized and light brown, about 20-30 minutes. 2. While the onions cook, prepare the potatoes. (If using leftover mashed potatoes, skip to step 3.) Put potatoes in a saucepan, and cover with water. Stir in 1/2 teaspoon salt, and bring to a boil. Cook for about 15-20 minutes until soft when pierced with a fork. Drain water. Ideally, mash the potatoes by using a ricer or food mill to achieve a smooth consistency. Or use a masher. Have the warm mashed potatoes in the saucepan, and then add milk and butter. Mix to melt the butter and incorporate. Turn on a low flame if needed to melt the butter. 3. Stir in onions and salt and pepper to taste. Really taste the potatoes for flavor and consistency, and adjust as needed. When the potatoes have cooled somewhat, stir in the dill. Enough low sodium chicken broth to moisten the meat (up to 1/2 cup). 1. Taste the brisket and gravy. Add salt and pepper if needed. Once the raw egg is added, the mixture cannot be sampled for seasoning until after it is cooked. 2. Place the brisket, gravy, onions, and egg in a food processor fitted with the metal blade. Make sure the meat is surrounded by some liquid– add broth if needed. 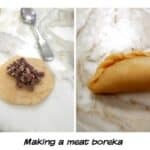 Puree the meat into a smooth, moist paste that can hold its own shape. Add broth as needed. 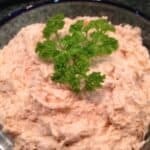 The consistency is similar to pâté and a little more moist than chopped liver. Do not make the mixture excessively wet. 1. Put a large pot of salted water to boil for later. 2. On a work surface line up four wrapper squares next to each other so that they form a large square. Scoop 1 teaspoon of filling onto the center of each square. 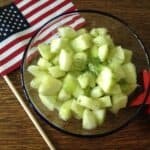 I used my melon baller to scoop; it was the perfect size and shape. Then brush egg wash across the two perpendicular inner seams, so that each square has egg wash on two sides. 3. Fold each square in half into a triangle. Lightly press along the two seams to seal. The egg wash does an excellent job of adhering. If your triangle corners are extra floppy and fragile, fold in 2 points of the triangle like an envelope and seal with two dots of egg wash. As you work, keep the unused wrappers and the folded kreplach covered with a damp towel to prevent the dough from drying out. Continue working in groups of four squares until finished wrapping. 4. Next the folded kreplach are boiled. Do not crowd the pot of boiling water, or the kreplach may stick to one another. I boiled about ten to twelve kreplach at a time. Boil for the amount of time recommended on the wonton wrapper package. It should be about 3 to 5 minutes. Remove kreplach with a slotted spoon or spider. Place kreplach on a cooling rack with a towel underneath. 5. If you plan to serve the kreplach later, let them cool. Store them in an airtight, sturdy container with wax paper between the layers. 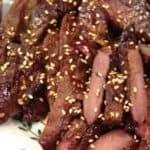 Refrigerate for up to two days or freeze. When ready to serve, defrost the kreplach in the refrigerator for one day, or let sit out on the counter for one hour. 6. The last step is to pan fry the kreplach. Coat a large fry pan with a layer of oil about 1/8 inch deep. Heat the oil on medium high heat until the oil has a wavy pattern in it, but do not burn the oil. Take care not to splatter yourself with hot oil; lower the flame a little if necessary. Place the boiled kreplach in the fry pan in a single layer without touching each other (to prevent sticking together). Cook on one side until golden brown on the bottom, and then flip and cook on the other side until golden brown as well. It should take about 5 minutes per side. Remove the crispy kreplach from the pan, and drain on a cooling rack lined with paper towels. Serve warm and enjoy. Thin creme fraiche (or sour cream) with a little milk and stir well. Stir in finely sliced chives. Use an apricot jam that is not chunky and not too sweet. 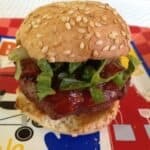 I used Trader Joe’s Apricot Preserves. Thin the jam with a little water and stir well. Optional– mix in a little Major Grey’s Mango Chutney to add some tang. These were so, so, soooo good! Loved them! Thank you Dorothy, and thanks for organizing the recipe links.